Primary Tier- 345 sq. in. Upper Tier- 317 sq. in. Auplex is a BSCI manufactory who produces both ceramic and metal parts of ceramic barbecue grill, and the first factory who use computer to automatically control the production of electrical kiln. In the early time, we are doing metal units, for we are abundant in clay. From 2010 we specialize in producing all kinds of bbq grill with more than27000 sq of factory area and over 280 experienced staffs. They are always available to discuss customer’s requirement and try their best to meet customer’s needs. Still concerned about the Camping BBQ Cooking Package? Don't worry! 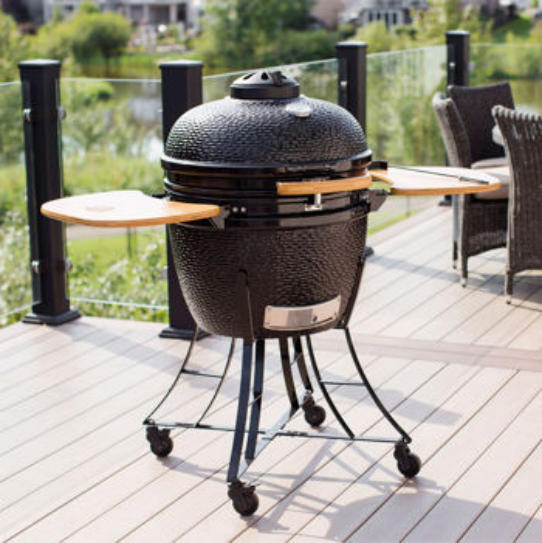 Auplex will provides you the most proper and safe packaging for the kamado ceramic barbecue grill. We use thick foam on the bottom of the ceramic barbecue grill and sepcial design package which for your 24 inch outdoor kitchen Camping BBQ Cooking. Carton Package for Camping BBQ Cooking sample, Wooden case for Container. A. A strong team can provide professional and constructive suggestion for our customers! 2. 90-days for side shelves of 24 inch Camping BBQ Cooking. 4.This Warranty is not transferable to subsequent owners. Why choose Auplex 24 inch Camping BBQ Cooking? 1. All of our kiln are computer-controlled electric kiln, the quality of ceramic grill would be more stable. 2. We're the only manufacturer who can produce both ceramic and metal part, it decide us would be more flexible to achieve customer's OEM requirement, and we can control each parts' quality all by ourself. 3. Strict quality inspect process before product sent to our customer. 4. Swift response and good communication from our team, to confirm there's "NO SURPRISE" when you get the 24 inch Camping BBQ Cooking. 5. We're RESPONSIBLE FOR OUR 24 inch Camping BBQ Cooking. About Order from Auplex 24 inch Camping BBQ Cooking. Optional Applications: Commercial BBQ store, restaurant, home.